The staff and families of Seward County Broadcasting enjoyed an evening of food and fun at Ayr Lanes in Liberal. The evening consisted of a wide selection of food offered at Ayr Lanes like, hot wings, pizza, cookies, and soft drinks. 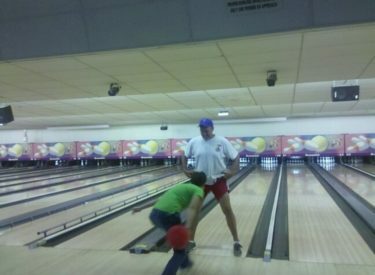 The staff also showcased their skills on the lanes with a regular game of bowling, followed by a game of wacky bowling. The “trick” frames were designed by Ayr Lanes Manager Robert Burkey and staff. This entertaining game consisted of bowling between a team members legs, opposite hand bowling, granny throws, sit down bowling and more. Burkey stated that Ayr Lanes “experimented” with Seward County Broadcasting and used them as “guinea pigs” for their first ever Corporate Night., With the success of the evening, Ayr Lanes will be offering Corporate Nights for area businesses. It is designed to be a night of team building and fun. The staff of KSCB and The Legend would like to thank Robert Burkey and the staff at Ayr Lanes for a great time, and would encourage other companies and businesses to contact Ayr Lanes about scheduling an evening about having your own Corporate Night.